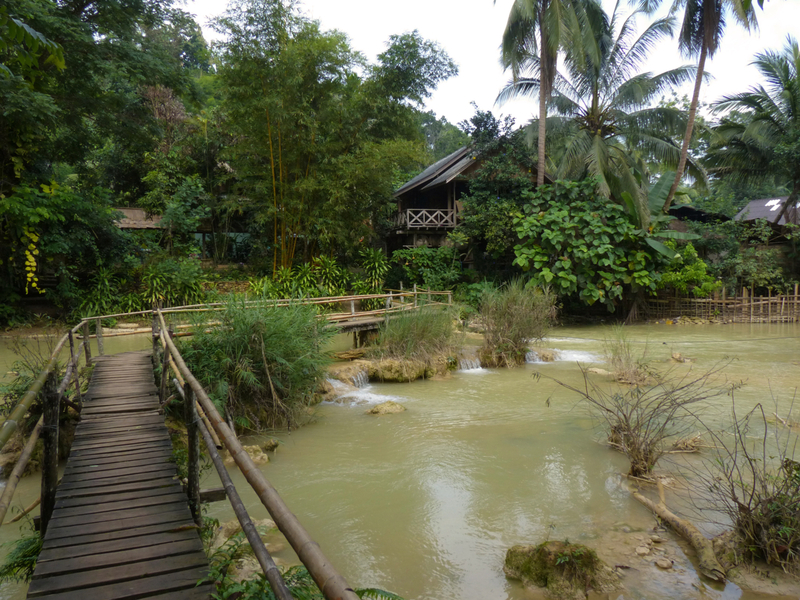 They say that you always stay longer then you plan to in Luang Prabang. Michel and I originally planned to stay for 3 days and now, a week later, we don’t know when we will leave. We arrived in Luang Prabang after a rough ride on a big bus. The travel time was about 8 hours of pretty slow going on mountainous roads. The view was spectacular! So many places we wanted to stop but the bus just kept going. 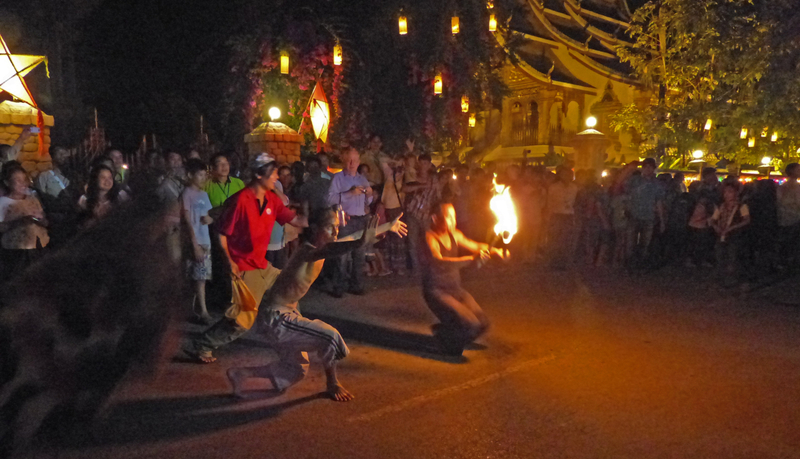 We seemed to have arrived in Luang Prabang before the rest of the crowd. After spending a few nights in an expensive hotel Lao Deum Nam Kahn View(60$) we moved to a comfortable hotel with a view on the Nam Kahn river for $25 (200000 kip). We are the only people in the hotel and loving our solitude. We were dreading Luang Prabang because of the crowds and expensive time we encountered here 6 years ago but we did not find them this time. 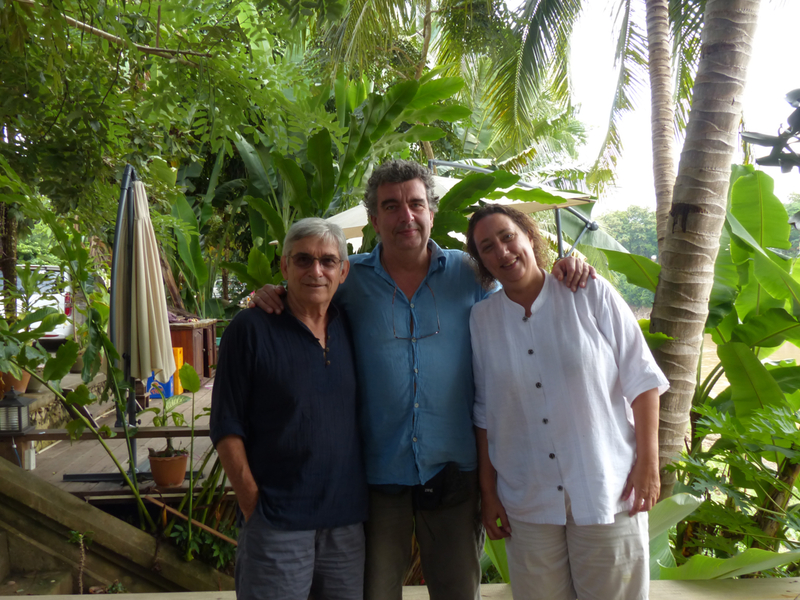 Soon after we arrived in Luang Prabang we met an old friend Jean Louis Dulaar who knows the area well. 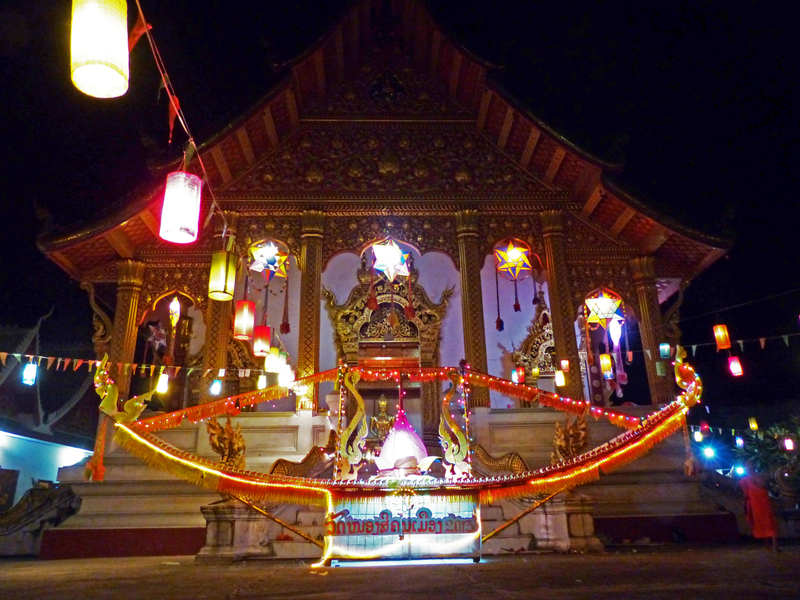 He was able to introduce us to a Luang Prabang would not have seen if just passing through. Jean Louis is an artist, although he might not tell you so, and is following his quest to find and create natural dyes. He uses them to paint fabrics. He has an energy that has inspired our own creativity. My words will not be enough to describe his work. You must see it yourself at http://dulaar.blogspot.com/. 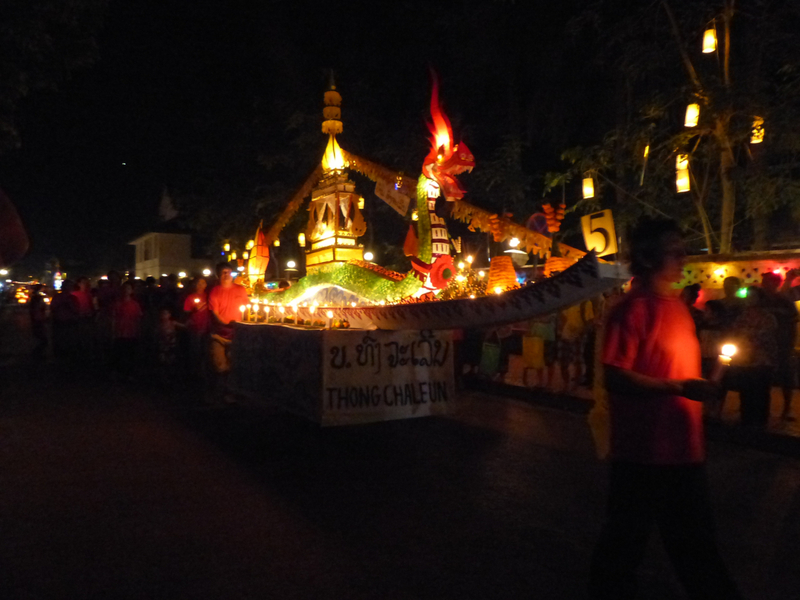 We arrived for The Festival of Lights, this is the “Lai Heua Fai” Festival or the festival of the fire boat. 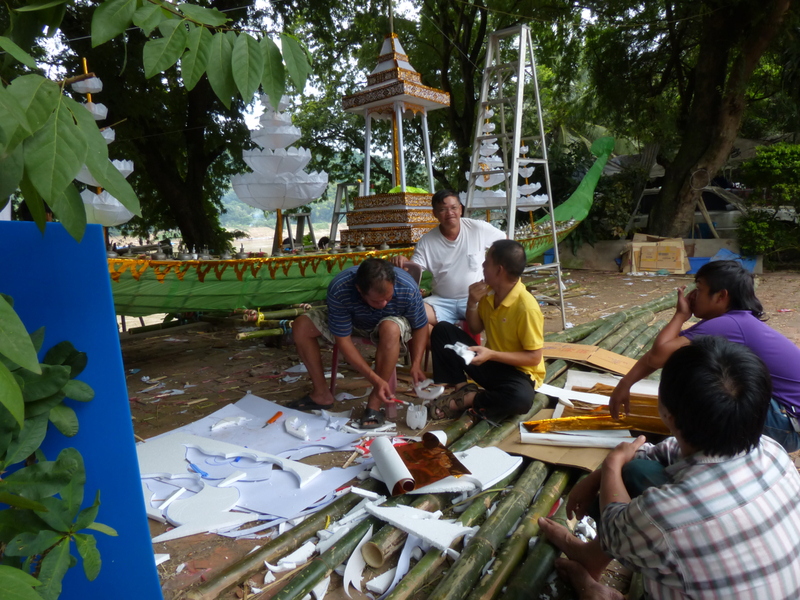 Each family builds a boat made of bamboo and other material. 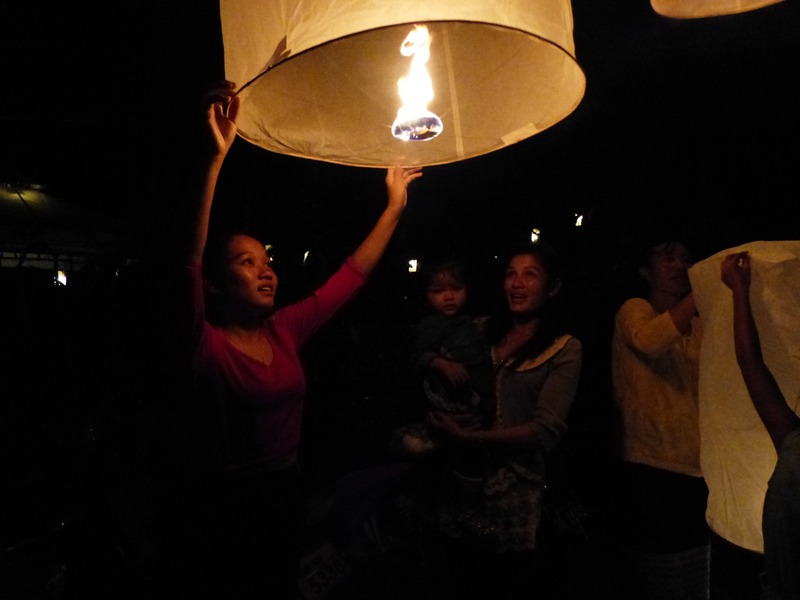 They cover it with lights and candles and then float it down the Mekong for good luck. 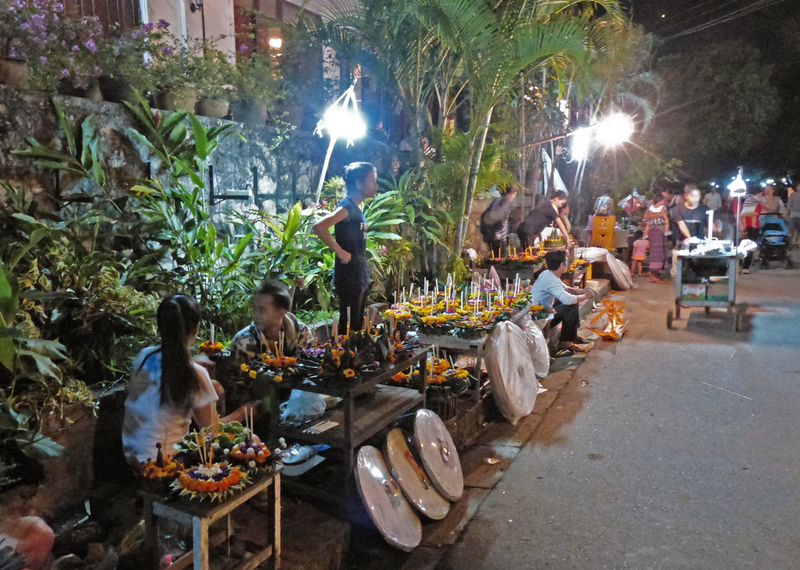 The festival occurs with the full moon but preparations start days before. 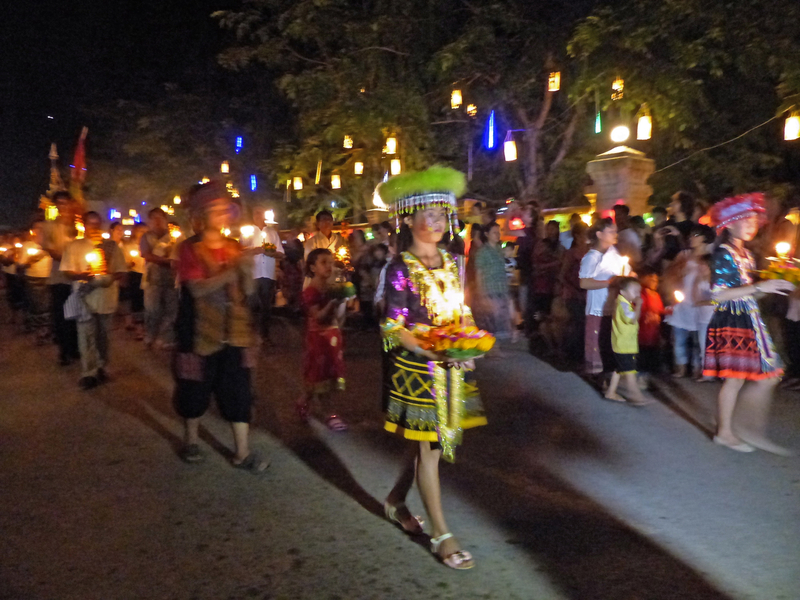 The children at the Luang Prabang Cultural Center practice dancing for the parade that will occur the night of the festival. 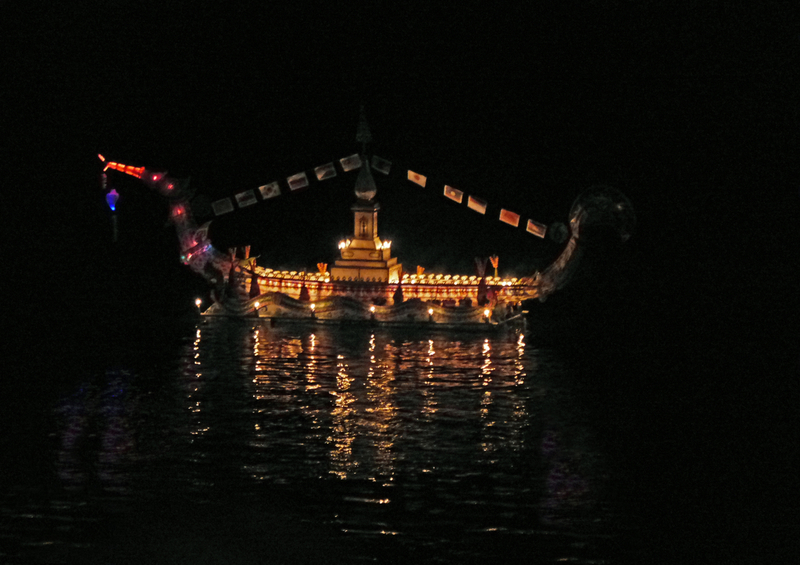 The monks in the temples prepare the lights and dragon boats with great care. They are happy for anyone to come and visit the temples to see their work in the evenings before the festival. The locals shops are all also adorned with hand made decorations filled with lights. On the night of the festival it seemed like the entire town was there for the parade. 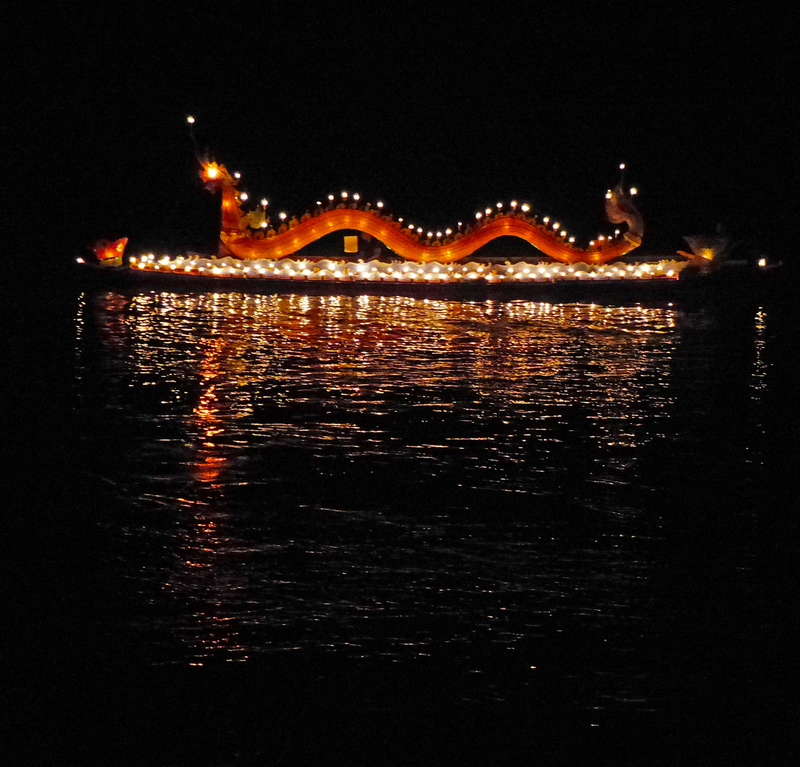 There were hundreds of dragon boats. Each dragon boat is being celebrated by the community who had created it. 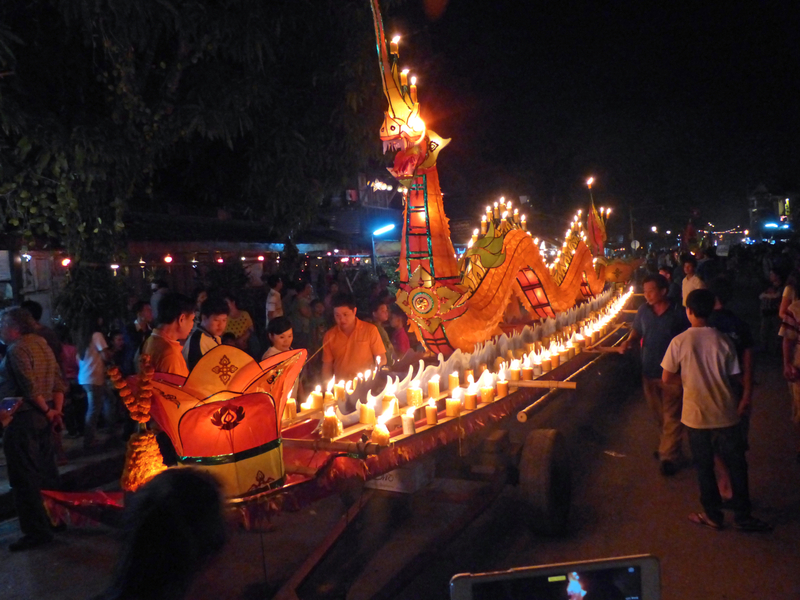 The feeling in the town is magical and full of excitement as somehow these heavy floats are carried through town and down to the Mekong river and there released. The river carries them away as each family prays for a good planting season now that the rainy season has ended. Along with the boats everyone floats there own individual wish down the Mekong. The wishes are made of colorful flowers and lit candles attached to a slice of buoyant palm tree. 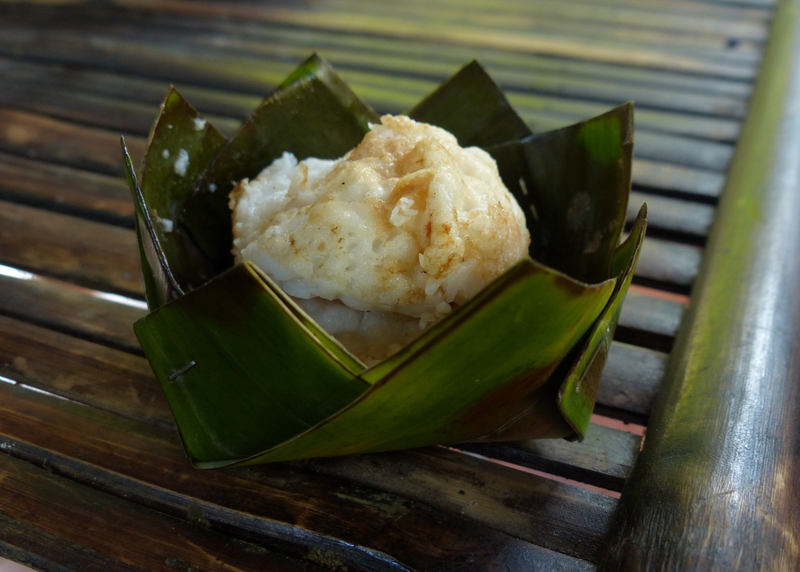 There is also delicious street food everywhere. 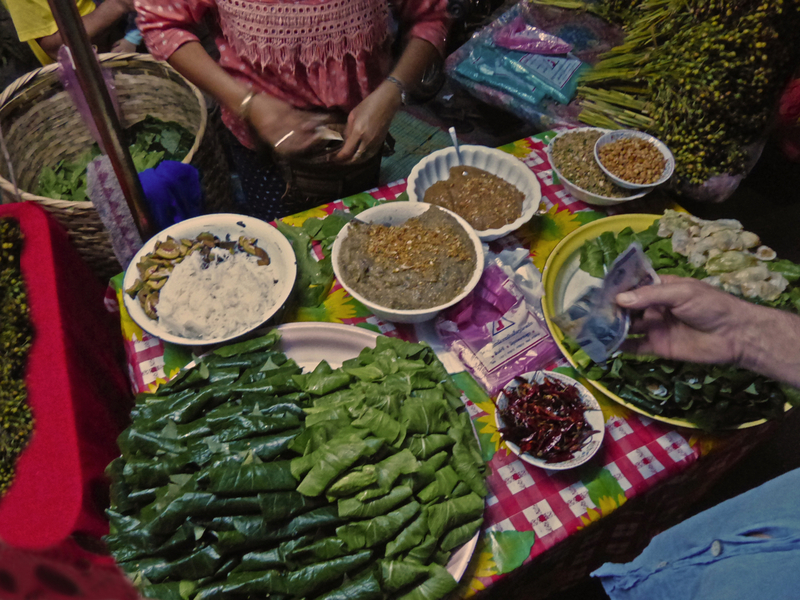 These pieces of lettuce are filled with a lovely sweet nut paste and herbs. All freshly prepared and sold everywhere at the festival. You won’t find these in the restaurants though. You must buy them in the street. Somehow these small hot air ballons sneak up between power lines and trees as though heading straight for the moon. In a way that is similar to sending your wish for good luck down the river you may also wish for luck from the sky. 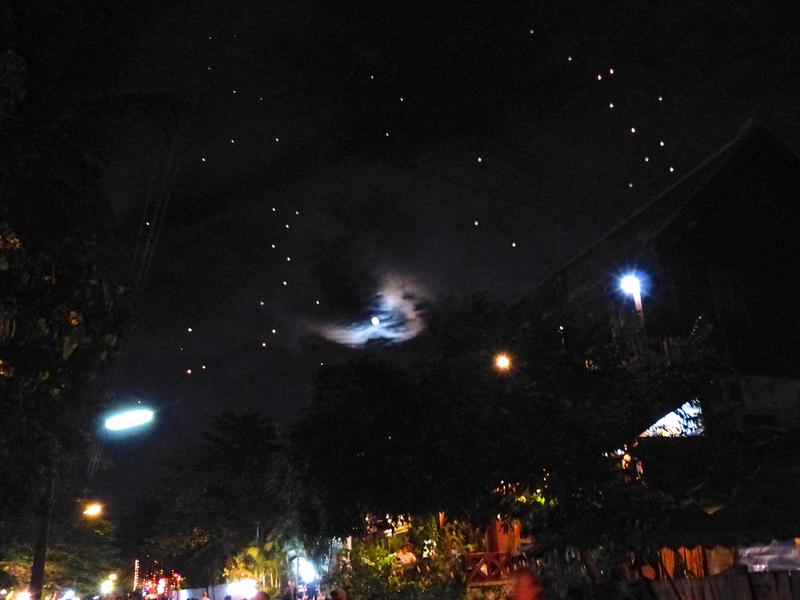 The full moon was surrounded by thousands of wishes floating up to the heavens. 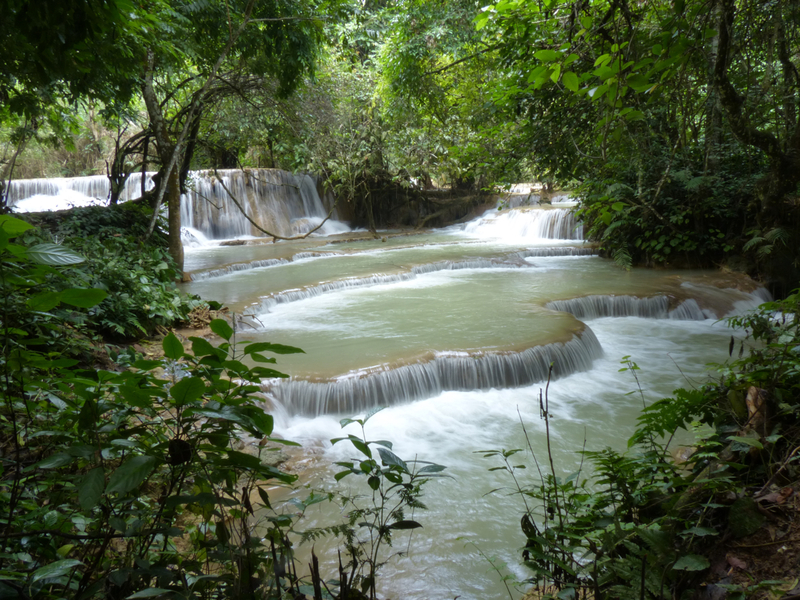 Jean Louis arranged for us to travel to a waterfall called Kuang Si about 30 kilometers away from Luang Prabang. 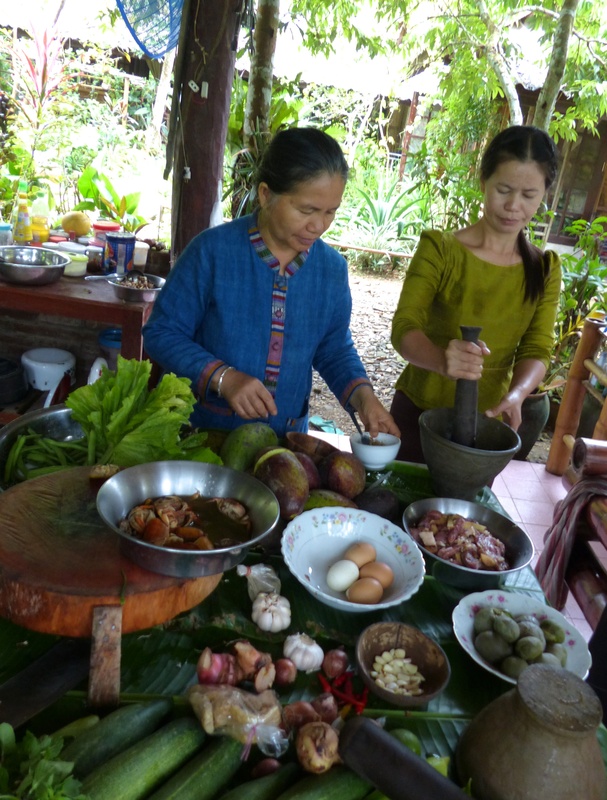 There we were also invited to a lunch that would be prepared by the owner of the property Mrs. Vandara Amphayphone. 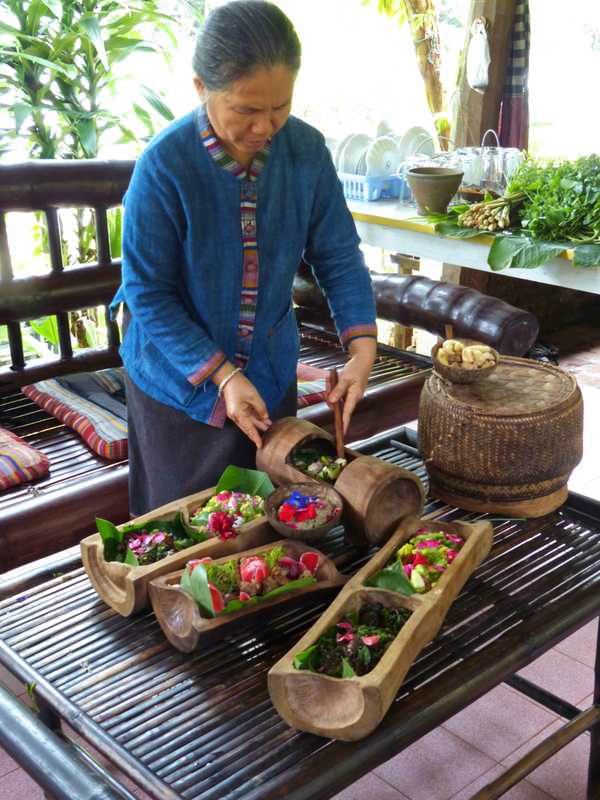 Mrs Vandara is an important member of the Luang Prabang community. She has more than one guest house and has a silk weaving studio in town. http://www.vanvisaguesthouse.com or http://naturebag.org for more information. Her kitchen and few guest bungalows are next to a downstream version of the waterfall that makes you feel like you have entered another world. She and her helpers spent a few hours preparing our meal. Almost all of the ingredients were picked directly from her garden. 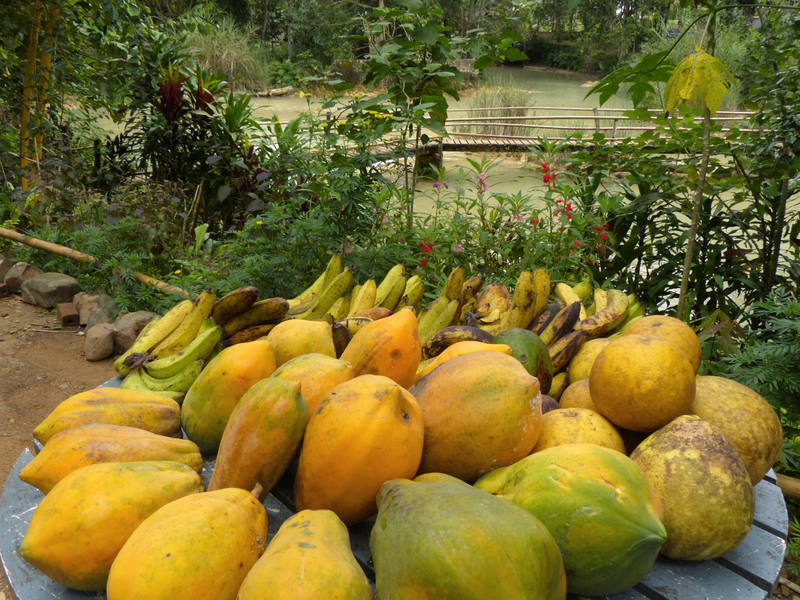 The garden is full of avacados and fruit and all items were carefully selected by Mrs Vandara before she demonstrated her cooking techniques. The kitchen is outdoor and all cooking is performed over fire. 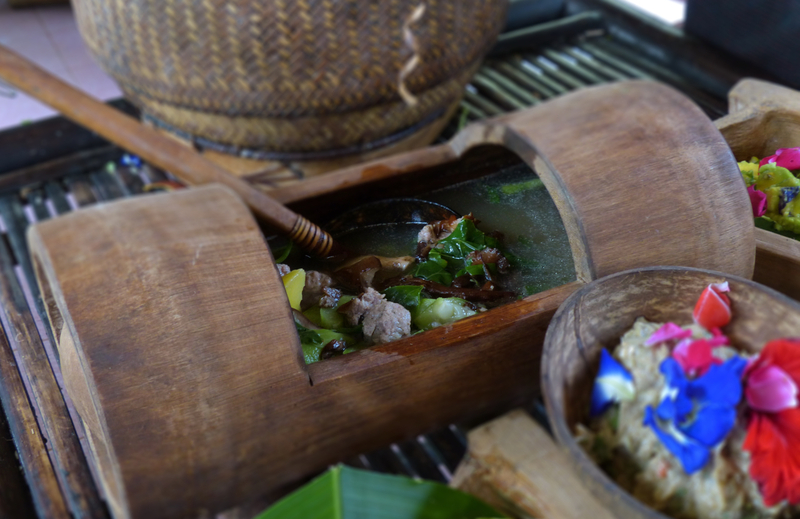 The dish made of crab and local herbs were ground into a paste come from a recipe once prepared for the king by her grandfather. As part of the preparation, Mrs Vandara selected flowers from the garden which were used as garnish and as ingredients in the food. It was as though we had been transported back in time. The surroundings were pristine. 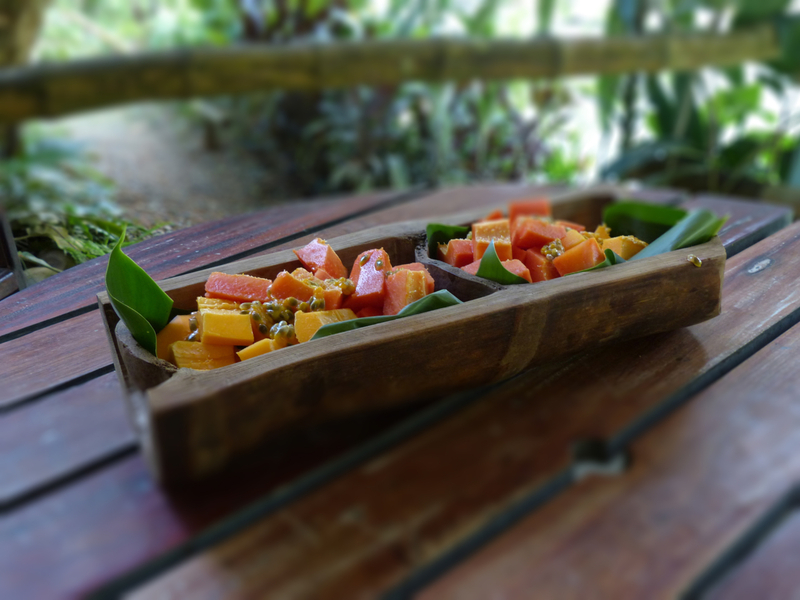 The food as fresh and natural as possible. The skill that was demonstrated during the cooking could only have been cultivated by recipes handed down for generations and years of perfecting each one. We are grateful to Jean Louis for sharing the experience. We are happy to have Mrs Vandara as a new friend and know that we received an unique and very special day in her little paradise. Hi Claire and Michel, How extraordinarily beautiful the scenery is there. And you appear to be Giants there compared to the Monk in the picture. How fun for you! The mountains look so amazing like a painting. 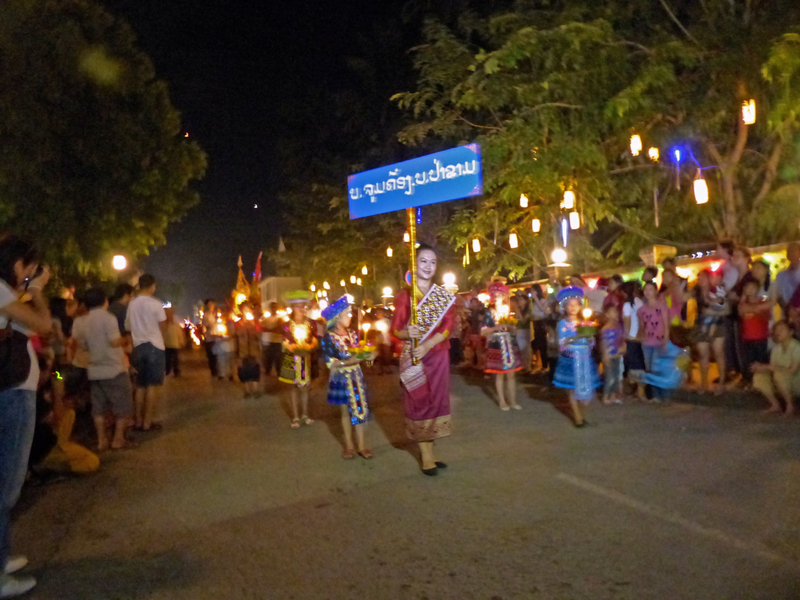 And the festival of lights…. oh my how wonderful it must have been to be there for that. I can only imagine what it is like to go through the day eating, seeing, enjoying, with hardly a care in the world. I looked at Jean Louis’ work/page…. very very beautiful. How wonderful to connect with him. So glad you are also making new friends. Look forward to hearing more and talking in person when you have some time. Thank you so much for sharing this wonderful experience. May I have your permission to use some of your lovely photos for my Khmu Laos facebook page, and in my NatureBag.ORG features? I work for the JungleVine® Foundation (non-profit) and I find your images captivating and your expression of the Khmu/Lao people irresistible. 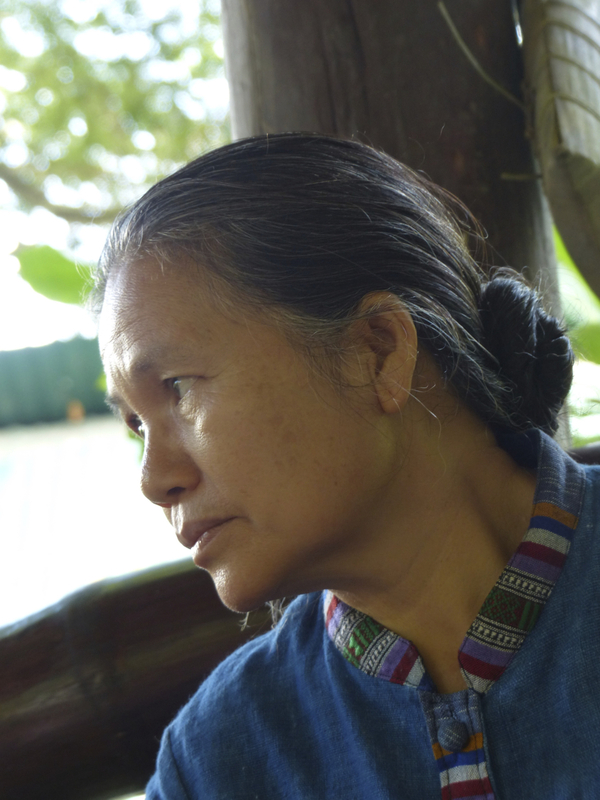 The Khmu Laos Poverty Reduction Project sponsor, Bill Newbrough, spends much time in Laos and knows Mrs. Vandara. Our Nature Bags are made in remote Khmu villages. The Project accomplishes three things. 1. It provides a source of income for Southeast Asia’s poorest people. 2. It preserves an ancient craft, handed down for generations. May I use some of your images? Thank you for your interest in the photos and for your inquiry regarding using them. I took a look at your website and it looks like your organization is doing good work toward helping the Khmu Laos people. My husband is a professional photographer and plans to use many of his photos from Asia for his upcoming work. However, it may be that he will donate some of them to your organization. Would you please provide me with a list of the photos you would like to use. I will discuss the list with him and get his approval first. 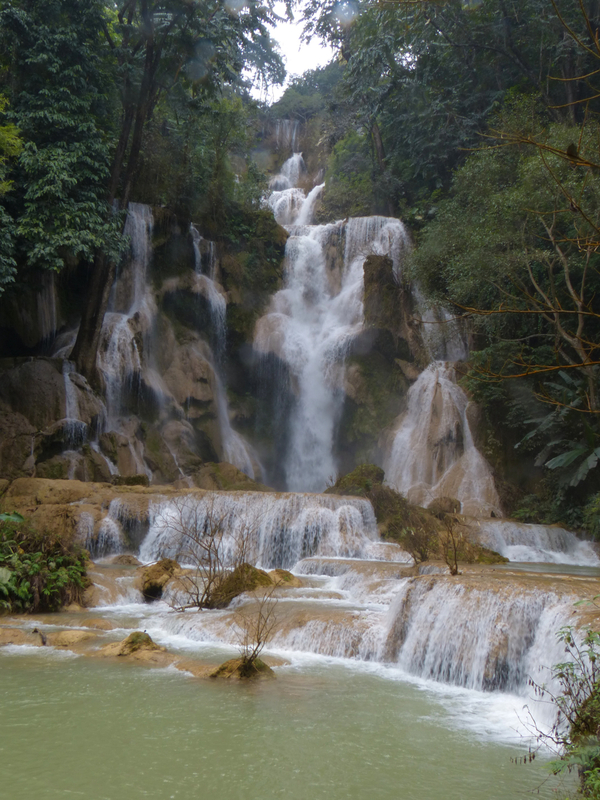 We will be back in Luang Prabang September of this year for 3 months and are always interested in meeting people who have taken a personal interest in Laos has we have. If you are going to be in the area during that time let me know. 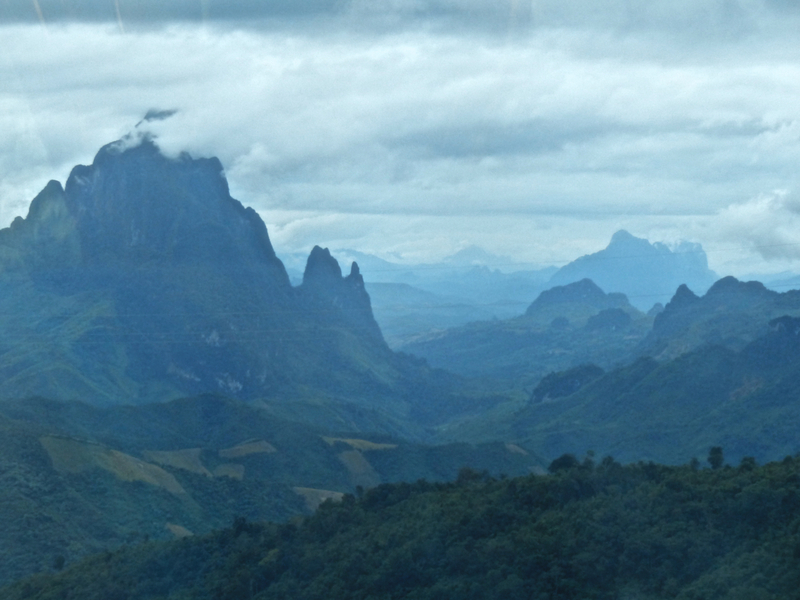 I would like to hear a our your experiences with the Laos people.